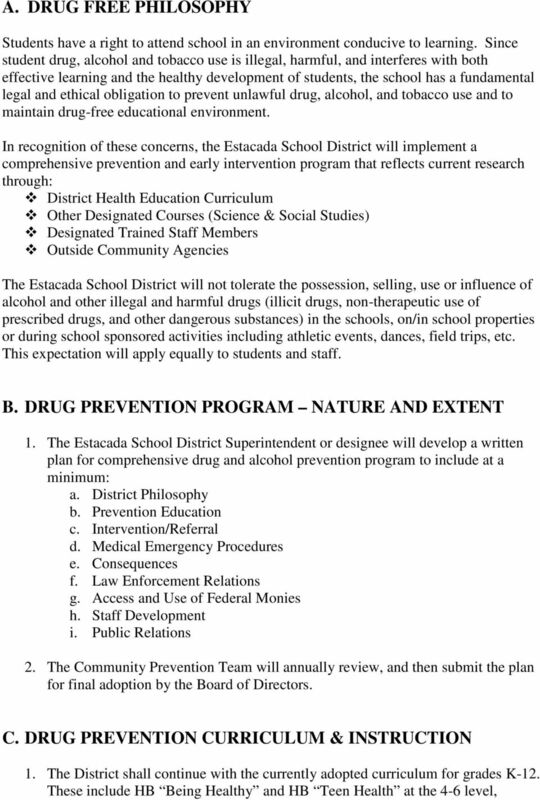 Download "ESTACADA SCHOOL DISTRICT 108 STUDENT DRUG AND ALCOHOL PREVENTION PLAN"
2 INTRODUCTION Estacada School District #108 has as its three year plan the development of programming in the following areas: 1. A comprehensive program aimed at prevention instruction with regards to alcohol, tobacco, and other drug use/abuse. In addition, the program should include an intervention component to assist individuals and families in dealing with alcohol, tobacco, and other drug use/abuse. 2. An active Community Prevention Team to ensure broad input, support, and review of the district s action plan 3. A Student Assistance Program to provide prevention and early intervention assistance for youth affected by alcohol and other drugs. 4. A comprehensive student and staff development program that continues to address basic information, laws, current research, and available resources. 5 property, will direct the student to the office or designated area and will report the information to the building principal of his/her designated representative. Behavior/patterns which suggest the effects of alcohol or other drugs include, but are not limited to, possession of drugs or drug paraphernalia, academic performance, excessive absence or tardiness, emotional or violent outbursts, withdrawal and isolation, inattention or sleeping in class. 4. 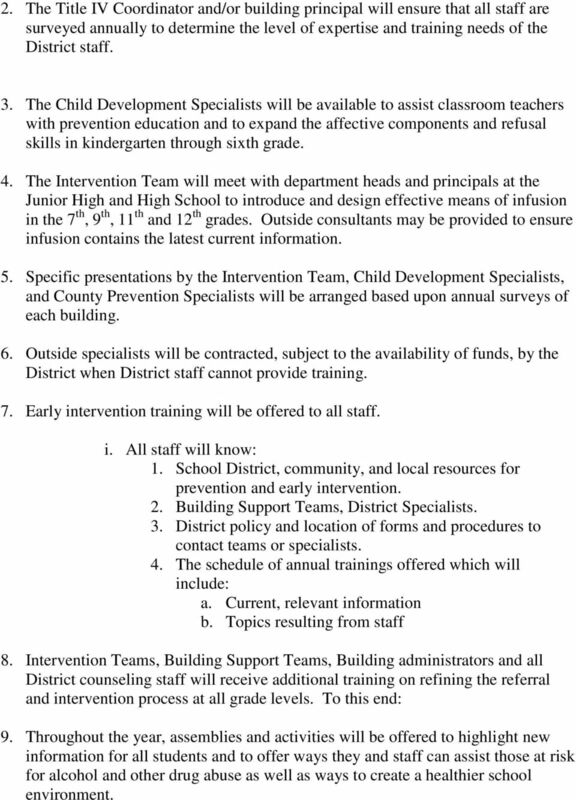 The building principal or designee will directly intervene to implement policy JFCI/JFCH and activate the appropriate intervention team process. 5. As required by Federal Law and District policy, similar concerns about staff members will be referred to the appropriate supervisor. The supervisor will initiate referral to the District s Employee Assistance Program (Policy GBEC). 6. In case of a drug related medical emergency, such as an overdose or an allergic reaction, immediate notification to the community emergency care unit (911) is required. Staff members will assist the student in any way possible. Parents/guardians shall be contacted immediately. A staff member shall be designated to accompany the student to the hospital or emergency medical facility if parents/guardians are unavailable to do so. In general, drug emergencies will be handled like a serious accident or illness as per each building s Emergency Response Plan. 7. The District will include in the Student/Parent/Staff Handbooks information regarding the District s intervention and referral procedures, including medical emergencies. E. CONSEQUENCES 1. Students, while under school jurisdiction, on or off school property during the school day, or attending school sponsored activities, who possess, distribute, sell or use, or give evidence of having consumed alcoholic beverages, drugs or narcotics not taken at the direction of a physician or other substances intended to alter mood shall be subject to intervention, discipline, suspension, expulsion and/or other appropriate alternatives. 2. Staff, while under school jurisdiction and/or with student responsibility, on or off school property during the school day, or attending school sponsored activities, who possess, distribute, sell or use or give evidence of being under the influence of alcoholic beverages, drugs or narcotics not taken at the direction of a physician or other substances intended to alter mood, shall be subject to intervention, discipline and other appropriate alternatives. 6 3. Procedures JFCI/JFCH will be implemented. 4. The District will include in the annual Student/Parent/Staff Handbooks information regarding the District s code of conduct explaining expected behaviors and related consequences for violations of the conduct code. F. LAW ENFORCMENT RELATIONS 1. It is the intent of the District to maintain a cooperative relationship with law enforcement agencies. Law officers presence and participation in school programs are encouraged to promote a positive attitude by students toward police. 2. Whenever a student is suspected of involvement in a crime, the administration will notify the local law enforcement agency. 3. The administration will notify parents/guardians, as soon as possible, regarding any policy action at school. Exceptions to this would occur when such notification is contrary to established legal procedures or when immediate action is required to ensure student welfare. 4. The Superintendent or designee will consult with the Sheriff s Department to develop appropriate procedures for the exchange of information. G. DRUG/ALCOHOL MONIES 1. 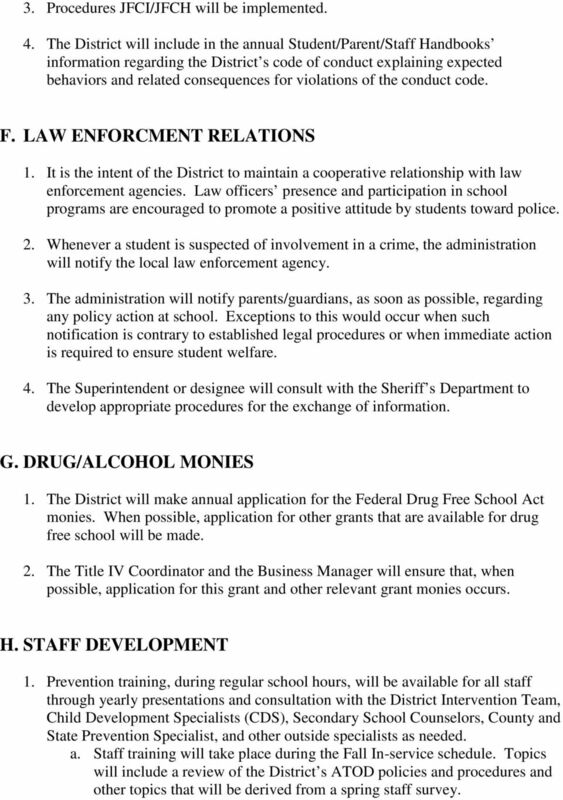 The District will make annual application for the Federal Drug Free School Act monies. When possible, application for other grants that are available for drug free school will be made. 2. The Title IV Coordinator and the Business Manager will ensure that, when possible, application for this grant and other relevant grant monies occurs. H. STAFF DEVELOPMENT 1. Prevention training, during regular school hours, will be available for all staff through yearly presentations and consultation with the District Intervention Team, Child Development Specialists (CDS), Secondary School Counselors, County and State Prevention Specialist, and other outside specialists as needed. a. Staff training will take place during the Fall In-service schedule. Topics will include a review of the District s ATOD policies and procedures and other topics that will be derived from a spring staff survey. 7 2. The Title IV Coordinator and/or building principal will ensure that all staff are surveyed annually to determine the level of expertise and training needs of the District staff. 3. The Child Development Specialists will be available to assist classroom teachers with prevention education and to expand the affective components and refusal skills in kindergarten through sixth grade. 4. The Intervention Team will meet with department heads and principals at the Junior High and High School to introduce and design effective means of infusion in the 7 th, 9 th, 11 th and 12 th grades. Outside consultants may be provided to ensure infusion contains the latest current information. 5. Specific presentations by the Intervention Team, Child Development Specialists, and County Prevention Specialists will be arranged based upon annual surveys of each building. 6. Outside specialists will be contracted, subject to the availability of funds, by the District when District staff cannot provide training. 7. Early intervention training will be offered to all staff. i. All staff will know: 1. School District, community, and local resources for prevention and early intervention. 2. Building Support Teams, District Specialists. 3. District policy and location of forms and procedures to contact teams or specialists. 4. The schedule of annual trainings offered which will include: a. Current, relevant information b. Topics resulting from staff 8. Intervention Teams, Building Support Teams, Building administrators and all District counseling staff will receive additional training on refining the referral and intervention process at all grade levels. To this end: 9. Throughout the year, assemblies and activities will be offered to highlight new information for all students and to offer ways they and staff can assist those at risk for alcohol and other drug abuse as well as ways to create a healthier school environment. 8 I. PUBLIC INFORMATION The students, staff, parents, and community members of the District will receive information on District resources, community resources, and other local support for prevention and early intervention through options which may include: o Articles in the District s 108 o Letters and/or handbooks to all students/parents at the beginning of each school year listing the individuals, teams, District policy and procedures, and professional resources available to those in need of assistance. o The District will publish a list of its trainings and presentations that are open to the public. Schedules of in-services, trainings, and club activities that relate to prevention will be included in newsletters sent out by each building. 3. Use and/or abuse of substance is a detractor from the school s primary function of educating its students. 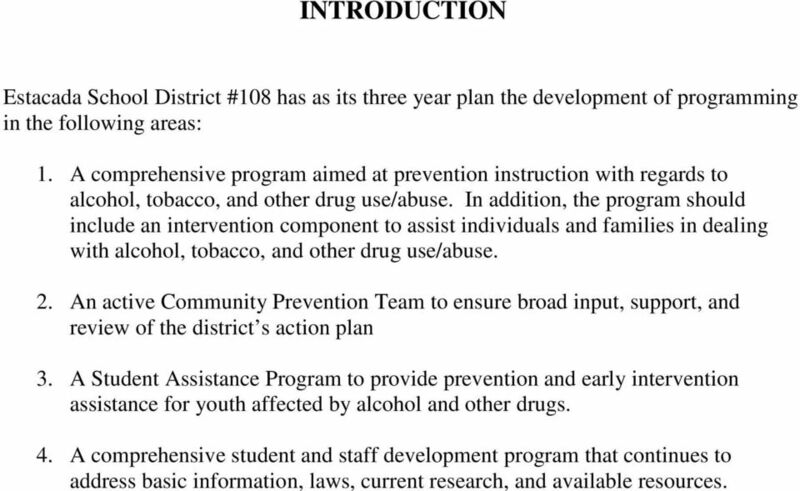 5530/Page 1 of 10 M 5530 The Board of Education recognizes that a pupil's abuse of harmful substances seriously impedes that pupil's education and threatens the welfare of the entire school community. 2. Substance Abuse Prohibited. 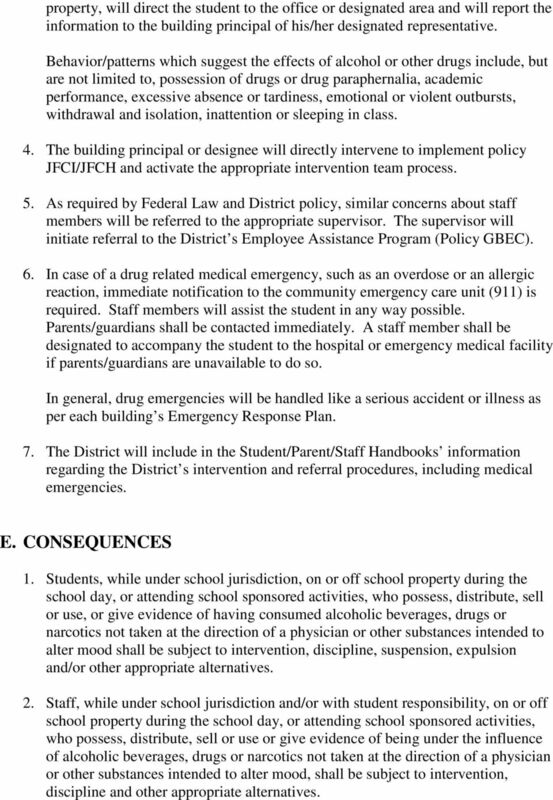 Substance abuse on school premises and during school programs is prohibited. STUDENT ALCOHOL AND DRUG ABUSE POLICY F7 The member schools of the Windsor Central Supervisory Union regards the health, safety and well being of all students, staff and visitors to be of primary importance. STUDENT SUBSTANCE ABUSE 5131.61. 1 - Express concern with education and prevention in all areas of substance abuse. A. This will be in effect on school property and at school-sponsored functions (including transportation provided by RSU 73 to and from facilities). TITLE: Alcohol & Drug Abuse. DRUG ABUSE: For purposes of this policy, the phrase "drug abuse" means the unauthorized use of any drug. A. Alcohol Ale, beer, wine, whiskey, rum, gin, or any other spirituous, vinous, malt, or fermented liquor or compound by whatever name called. The following procedures are established in implementation of Policy No. 5530, Substance Abuse. 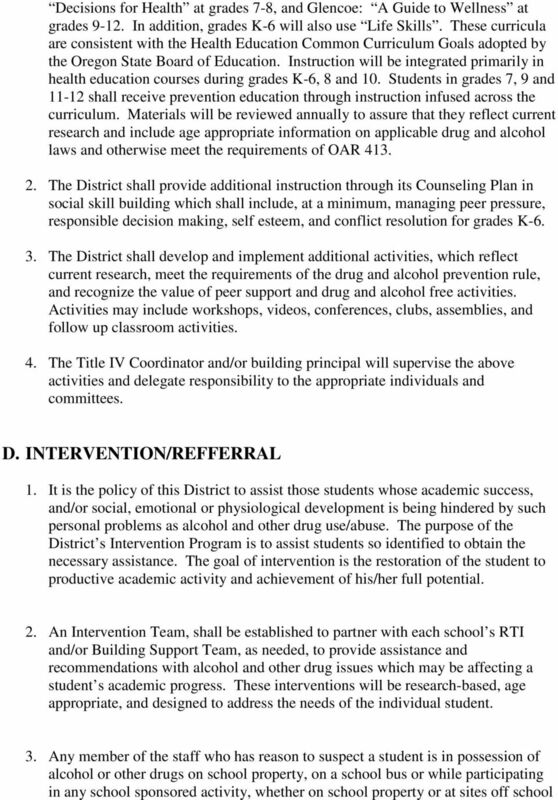 The following procedures are established in implementation of Policy 5530, Substance Abuse.